Minnie + Ree are passionate about making clothes that are comfortable as well as looking good. Our comfy clothing is flexi-sized and adjustable. We don't want to have a wardrobe half full of clothes that don't fit us because we have lost or gained a little bit of weight. We make clothes in two sizes - SMALL and AVERAGE. These flexible sizes will fit most women who are NZ/Aus size 8 to 18 which is about US sizes 4-16 or Eur sizes 34-46. Sonsie Swimwear has under bust and hip measurements (scroll to bottom of page for details). You may want to measure yourself to determine which size you would prefer. 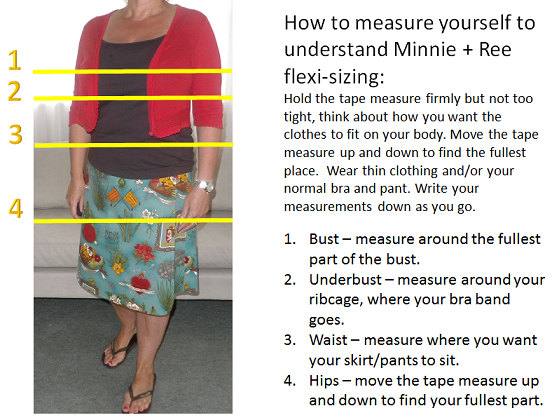 So grab a tape measure and follow the simple instructions below to wrap the tape measure around you.